I Love Portugese Tiles !!!!! On a trip to Portugal 3 years ago we were lucky enough to visit the charming town of Sintra. It was very picturesque and had adorable shops. We enjoyed visiting a few of the tile shops and found an artist painting tiles - a mural of a home in England. An idea formed - we happened to have a photo of our new summer house in Maine with us on the trip to show the friends we were visiting. We picked out the lettering and frame of the Lucky Stars sign- we wanted something that looked like waves and of course the stars in the corners. Nan - one of my personal decorators from the previous post had this made for me while she was living in Portugal. She is so organized - thinking of a house warming gift - years before she would visit!!!! She is a keeper!!!! 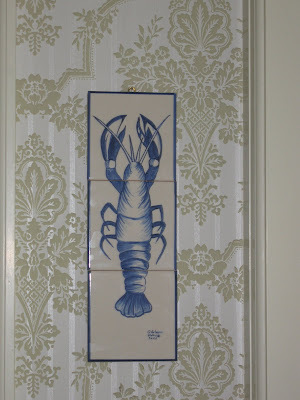 Love the blue lobster- so Maine. Here is the final product - after much back and forth - and a little trouble with cracked tiles we were able to hang our artists rendition of our Maine house above the fireplace. We have all of the tiles cemented to wood - that way we can always move the art piece- I love the look of tiles installed in a wall of kitchen or house itself- but would hate to leave it if we ever had to sell the house!!! Couldn't part with my memento of the trip! We do have our name and address of the shop in Sintra but this Sintra business man has a great website and my friend who lived in Portugal was aware of him and he had a good reputation- so if you are in the market - give them a try! A visit from my personal decorators !!!! Nan and Kip came for a visit and boy did they work while they were here! Don't get me wrong - we had tons of fun- but they did get a lot of decorating done!! Left hand side we picked up a very rugged fleur-de-lis statue and a rustic wicker tray to prop in the corner. At our favorite shop "Brambles" in downtown Belfast we picked up an iron basket and ivy plant. 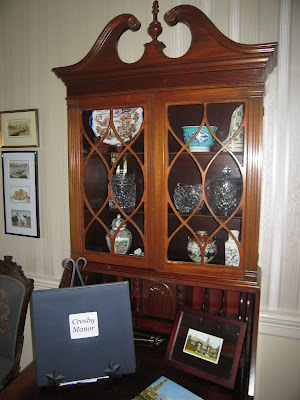 On the right hand side, we stuck a white urn that I previously had in the dining room. Kip ran to the field next to the house to pick some golden rod and stuck it in the urn- Voila! Looks great and really warms up the entrance. 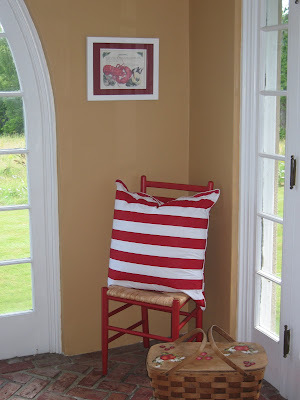 You can always add a pillow to a chair - even in the lobster room to soften the corner! Looks great and very nautical. It was also $9.99 at Homegoods!!! Couldn't resist! 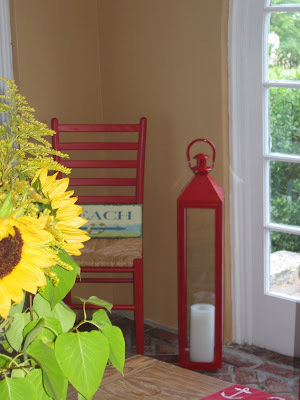 On the other corner of the lobster room we added a red lantern - the candle inside is a battery operated one that looks fabulous when lit and really can be used without any worry. Nan rightly feels that the dining room should be more dressy than the rest of the rooms in the house. 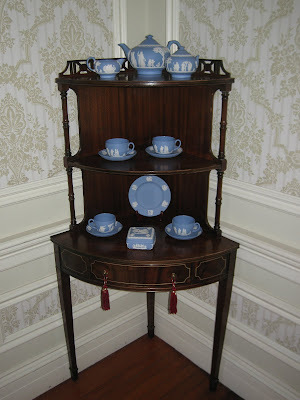 So she moved our blue Wedgewood tea set to the small delicate corner shelf in the dining room. 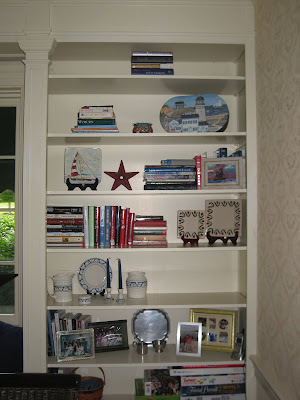 I think it looks great there- and much better than the Dedham pottery that was previously there. My little Portuguese houses have found a new home in the window area of the living room. 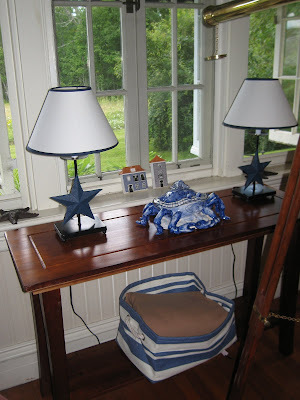 Nan also moved the extra throws that were previously on the bookshelves to their own basket under the window table. Easy to access on a chilly Maine night. Here is the total look - we still have a few things to fill in- some ivy on the right side and need to find a round topiary to stick in the empty corner on the left. Nan went around the house putting like stuff together for the shelves- Kip found my redware in the cabinet - tons of framed pictures were relocated to these shelves. 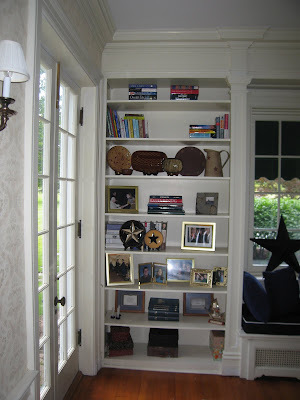 Nan also like to put similar things together- same subject books and collections of things!! These two Irish plates were languishing in the kitchen cabinets but I think they look great together on a shelf with plate holders. The Dedham pottery is way better suited to a more casual setting in the living room. Ivy will go in the hole! Nan moved some Waterford crystal biscuit barrels to the desk- much better spot to display them- and they make the shelves pop! All in all a great time rearranging and organizing - they both have to come back to visit again since we have tons more projects to tackle!!!! Thanks Nan and Kip!!!!! !